A Success Story – James Taylor | Service Coordination, Inc.
James Taylor is a 62-year-old, lifelong Maryland resident who grew up in Reisterstown. James was born with a mild cognitive intellectual disability but was not formally diagnosed until 2012 at the age of 56. As a young child, James had a close relationship with his parents. His mother was his primary care taker, but he also spent frequent afternoons fishing and enjoying nature with his father. James experienced challenges growing up, but he took comfort in knowing he had the support of his parents. James still reminisces about the enjoyment he received just being with his father as he drove to town. James no longer has any living family members but draws comfort from the memories created all those years ago. As a young man, James was a hard worker with a positive attitude. He was able to make a living doing janitorial work for over ten years. As James got older, he continued to live with his mother who assisted with his care until her own health began to decline significantly. She was forced to move into a senior living community in which James did not qualify to stay. For the first time in his life, James found himself on his own. Unfortunately, James no longer had the support he needed. This caused a great deal of stress to James and he began drinking as a way to cope. He struggled on his own and his health began to fail. As a result of his circumstances, James lost his job. Things spiraled quickly, and he found himself homeless, living on the streets unsure of how to make things better. At times, James would receive assistance with a meal or a place to sleep at a homeless shelter for the evening, but help was always temporary, and James became more depressed. When the shelters were closed during the day, he would sleep on benches and spend time wandering along the road. This pattern of behavior continued for years and James felt hopelessness and despair. He wondered if his life would ever change. In 2012, James found himself at Streets of Hope, a church operated homeless shelter serving people in Baltimore County. This is where he met staff member, Barbara, with whom he quickly became close friends. Barbara cared about James. She quickly became his advocate and helped him to access housing and other programs that he so desperately needed. She linked him with Health Care for the Homeless in Baltimore County. They provided access to the physician who was able to diagnose his intellectual disability, as well as assisting him to apply for SSI. 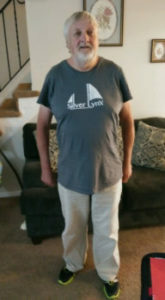 Things began improving for James and with assistance from Barbara, he was able to move into his own apartment in Towson in 2015. He kept up with his new responsibilities at first, but years of untreated anxiety and depression combined with alcohol abuse left James struggling to adjust. He found himself having trouble maintaining his new responsibilities as a renter. His health continued to fail which caused him to neglect his apartment further. He became once again at risk to return to the streets when his lease was terminated and moved to a month-to-month option with the understanding that he would be required by the apartment management to move out at the end of August 2017 if things did not improve. In May of 2017, Barbara decided she had to do something to help her friend before things declined further. She made a referral to the Community First Choice (CFC) program and at that point, Supports Planner Keyawna Hoyte was assigned to his case. Keyawna worked hard to develop trust with James. He had been through many negative experiences in his life and building trust with new people was difficult for him. James valued his freedom and feared being sent to an institution. At first, James declined the help from Keyawna, but she was persistent. Through her patience and kindness, she was able to help James better understand the CFC program. She explained that he had the right to choose the services, as well as the right to choose the providers of those services. She helped James to understand how accepting CFC services could provide support that he so desperately needed to make a better life for himself while remaining independent.